Most home PC users never back up important digital content such as photos, music and video - and run the risk of losing it all forever. For those of us serious about our data, we know that backing up externally is something we should do, but existing backup drives often require a time-consuming set up even before the first backup can be completed. 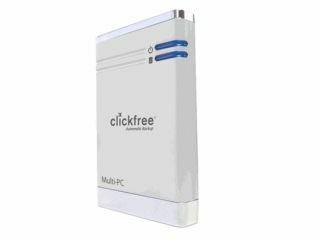 Clickfree devices are designed with the consumer in mind and require absolutely no software installation or configuring - you just plug it in via USB, and the device does the rest. As soon as you do, a backup application launches, your computer is scanned for files and your photos and data are backed up automatically. Although the Clickfree can work completely hands-off, you can adjust settings, like telling it to copy everything contained in specific folders while leaving others alone. Prices start from £74.99, with the drives available from Amazon, QVC online and direct from the Clickfree website. TechRadar has teamed up with Clickfree to give away three of its HD801 160GB drives - simply enter our competition to be in with a chance of winning one! Visit www.goclickfree.com for more information on Clickfree's range of products.